BiGBiRD / 400 Your Craftsman is a well renowned 1:400 scale manufacturer of high quality BiGBiRD aircraft models. Having been established in the market since the early 2000s, BiGBiRD / 400 Your Craftsman has earned the respect of many collectors around the world for their attention to detail and dedication to producing highly accurate diecast model aircraft. 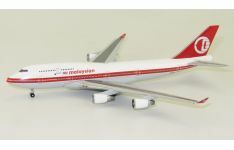 Known primarily for their outstanding 1:400 scaled reproduction of the Boeing 747 the majority of their precision models feature communication antennas and realistically designed landing gear, setting the precedence for other notable 1:400 brands. With Australia’s largest range of diecast scaled aircraft models and Oceania’s exclusive distributor of BiGBiRD Aircraft Models, Collectable Aircraft Wings Australia is your number one supplier of BiGBiRD / 400 Your Craftsman. Offering an industry leading pre-order and ordering system we allow our customers to order their favourite BiGBiRD Aircraft Models in just a few easy clicks! Product Description: Airline: Malaysia Airlines Aircraft Type: Boeing B747-400 .. 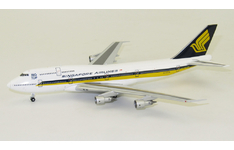 Product Description: Airline: Singapore Airlines Aircraft Type: Boeing B747-300 ..